“Research from the Dinca and Hart labs, paired with Lamborghini’s “hypercar” concept, will result in the Terzo Millenio, an electric sports car for the third millennium. Members of the MIT community who passed through the Stata Center courtyard last week likely found it hard not to notice the Lamborghini parked there as if it were visiting from the future. The car’s name — Terzo Millenio — says it all. Terzo Millenio is an automobile prototype for the third millennium, and its unique ability to deliver high peak power and regenerate kinetic energy, all while ensuring the ability to release and harvest electric power, can be attributed to the work of MIT associate professor of chemistry Mircea Dinca. The Terzo Millenio aims to be self-healing and electric — concepts that today seem about as far-fetched as the hovercrafts in “Back to the Future II”’s imagining of 2015. However, in reality, this technology is as attainable as it is visionary. 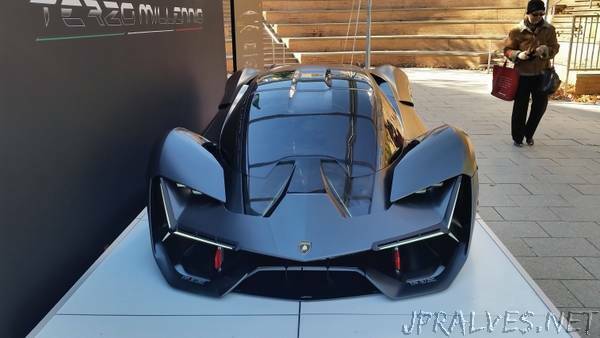 Lamborghini is relying on MIT to make its cars of the future operate on electricity, while maintaining the aesthetic standards and high-powered mechanical elements that make operating these luxurious sports cars so thrilling for those who drive them. In October 2016, Automobili Lamborghini began a three-year partnership with MIT that will grant Lamborghini exclusive rights to emerging research related to battery storage and materials science. Lamborghini’s mission for this partnership is to “rewrite the rules on super sports cars” by addressing energy storage systems, innovative materials, propulsion systems, visionary design, and “emotion.” By incorporating research from Dinca and John Hart, associate professor of mechanical engineering, who will investigate new carbon fiber and composite materials that could enable the complete body of the car to somehow be used as a battery system, the hope is that this ambitious, visually stunning prototype will become a reality. “We are thrilled to combine our expertise in advanced materials and manufacturing with the vision and support of Automobili Lamborghini, and to realize new concepts that will shape the future of transportation,” says Hart.